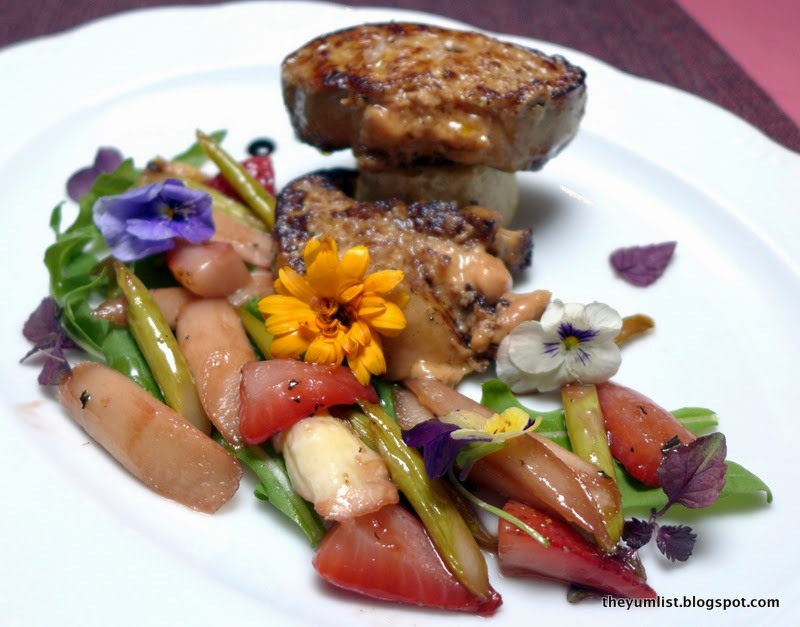 Fine dining is rare on the island of Penang. Best known for its spectacular street food and bargain prices, higher-end eateries are few and far between. But when you’re looking for something special, there are a couple of establishments that do a first-class job of elevating the dining experience to elegantly delicious heights. Feringgi Grill at Rasa Sayang is one such example and one of the most esteemed and long-lasting institutions of its kind. 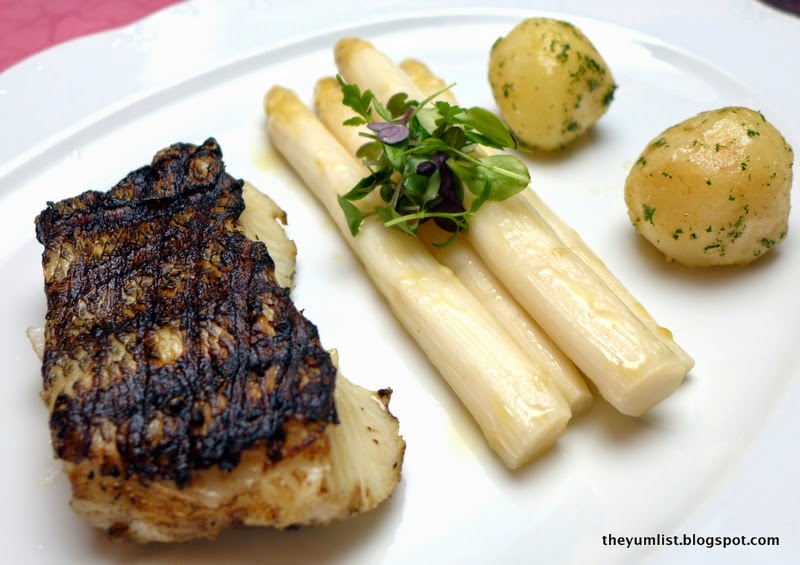 April and May see the chefs at Feringgi Grill celebrating European seasons with a special white asparagus promotion. White asparagus start their lives as the regular green variety, however are cultivated by covering their shoots with soil, depriving them of sunlight. Without the sun’s rays they are unable to photosynthesize, so don’t turn green and are less bitter than their conventionally matured counterparts. Picked young, the shoots are very tender and a prized European summer crop, and as such are the stars on this menu. Chef MatthiasTretbarFeringgi Grill offers a fine choice of wines by the glass. For hubby it’s the Californian Beringer Stone Cellars Chardonnay that starts the night and, for me the New Zealand Sixty Drops Marlborough Sauvignon Blanc (RM34). The chardonnay has twangs of vanilla on the nose and is creamy in the mouth with a medium body and finish. 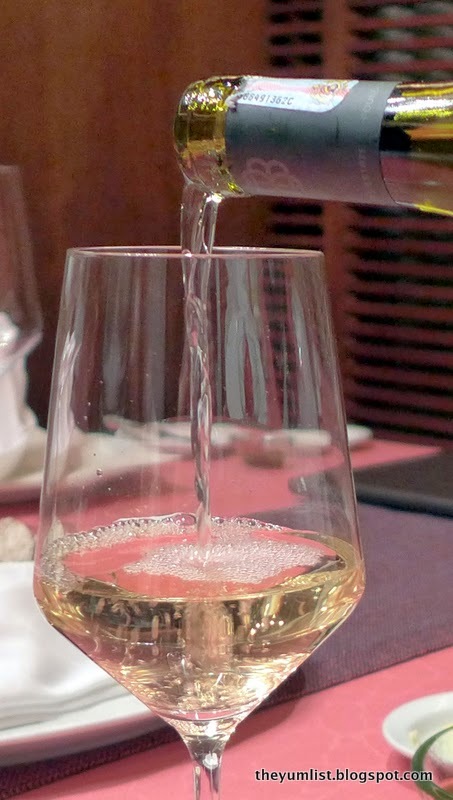 My sauvignon blanc offers mango and passion fruit aromas and a clean crisp ending. We’re both satisfied with our selections. 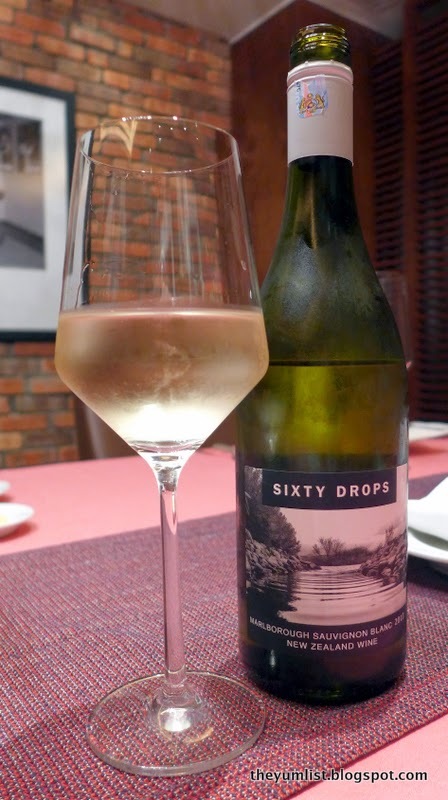 Sixty Drops Sauvignon BlancStir Fried White and Green Asparagus with Strawberries, Rocket and Foie Gras (RM95) is a decadent option for the starter. The tender young shoots are cut into shorter pieces and mixed with the berries, edible flowers and micro greens. A tart dressing cuts through the terrifically rich and creamy liver. It’s well balanced in both flavour and texture. Stir Fried White and Green Asparagus with Strawberries, Rocket and Foie Gras Soup turns this delicacy of the lily family liquid, in a Caramelized White Asparagus Crème Soup with Smoked Salmon and Caviar (RM32). Slightly sweet and lightly creamy the soup leaves a thin film of broth in the mouth. “Mmmm, I like this,” smiles hubby. 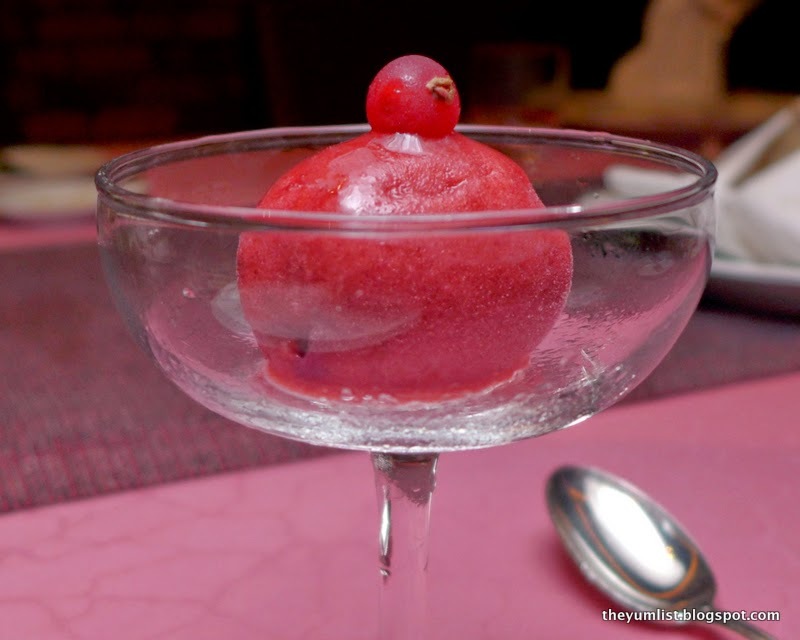 A raspberry sorbet cleanses the palate and is so good hubby suggests Chef opens up an ice cream stall in the centre of the city. Raspberry SorbetThe main courses reassign asparagus a supporting role alongside baby potatoes and a choice of sauces (Choron, Béarnaise, Hollandaise or Maltaise), and allow meat or fish to shine as the protagonists. We find the Canadian Cod (100gm RM118) flaky and moist. The Pan Fried Scallops (120 gm RM108) are golden around the edges and fine pot-bellied specimens, which disappear quickly from the plate. 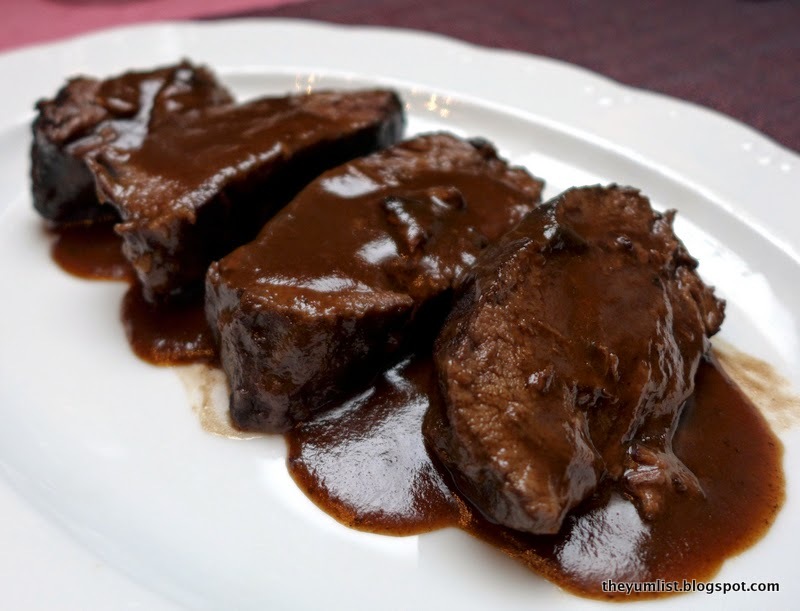 Lamb Chops (200gm RM158) are pink in the middle and have a moderately salty crust and, the Braised Beef Cheeks (RM128) are slow cooked for 14 – 16 hours in a merlot juice leaving them so tender that they fall apart at the touch of our forks. My favourites are the seafood, while hubby goes ga-ga over the lamb. Braised Beef Cheeks Fresh and light seems an appropriate way to end an asparagus filled menu, and the dessert we try admirably fits the bill. 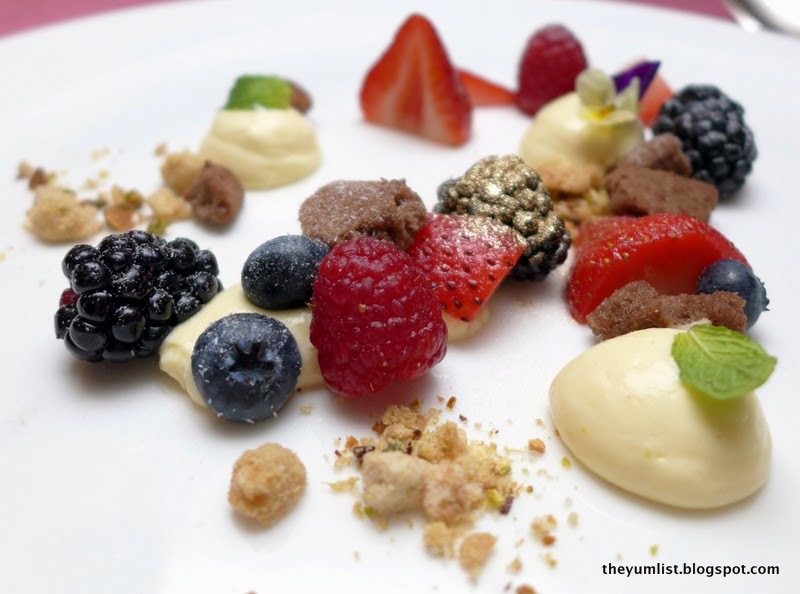 Grand Marnier Marinated Fresh Strawberries with Orange Yoghurt Mousse and Pistachio (RM32) is a palette of colours. Fragments of each are spread across the plate forming a messy tangle of delight and a playground for trying various bits on their own and mixed with each other. Grand Marnier Marinated Fresh Strawberries with Orange Yoghurt Mousse and PistachioHouse made chocolates finish the meal with a final burst of sweetness. 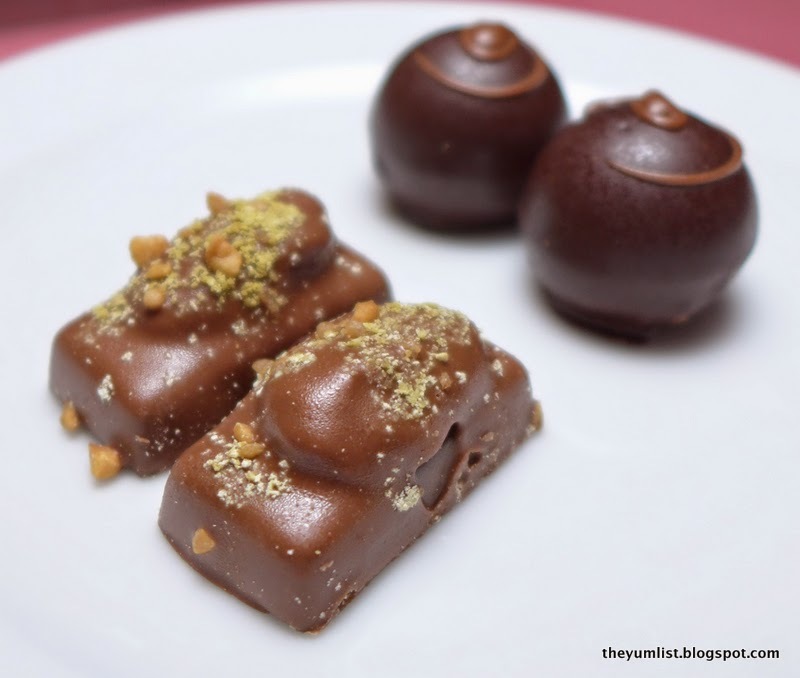 A petite nutty milk chocolate log and a dark cacao truffle ball are delicately decorated and a faultless ending. House Made ChocolatesThe White Asparagus Menu is available from the 1st of April until the 1stof June. Bookings are highly recommended, especially if you’d like to dine on a Friday or Saturday evening. 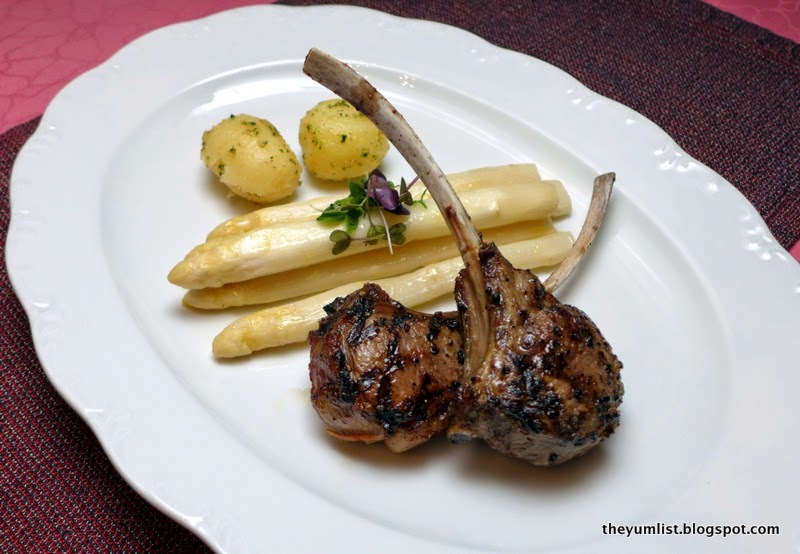 Reasons to visit: limited period to enjoy the white asparagus promotion; beautiful setting – try to visit before the sun sets to benefit from the lush garden views; we particularly loved the soup, seafood and lamb. Dress Code: Smart casual – long pants and covered shoes for men.